Basically, by the cause of heavy rain a particular area of the land submerged by the water, its called as flood. the breakage of dames and embankment of river or lake also makes the situation of a flood. A flood brings a lot of disaster. At so far, in Bihar, four major floods had been came in the year of 1987, 2004,2007 and 2008 respectively. Mainly the Kosi River is most important factor for the floods in Bihar. Over 2.3 million people was affected by the floods. The most affected bad areas were Madhepura, Araria, Bhagalpur and west Champaran. Many temples and tracks had drowned by cause of flood. Maharashtra flood- In 2008 year, Konkan area of Maharashtra had affected by the floods. Severely affected area were Chiplun, Rajapur, Khed and Mahad. 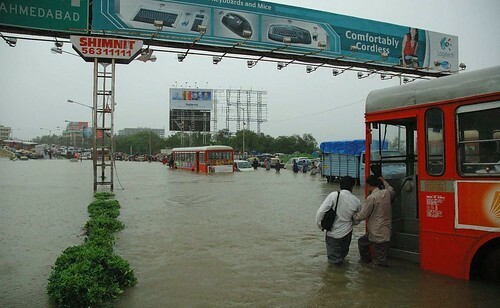 Gujarat Flood- In 2005 year, many parts of Gujarat were submerged by flooding like Ahmadabad, Vadodara etc. Cause of flooding trains were cancelled and also Airports were not operational. Above 15,000 people had transferred from affected areas. About 123 people had killed by this flood. In year 2009, in Kerala and Orissa, there were 13 killed by the flood, and many people are lost. Most affected area in Kerala were Kannur, Emakulam, Kozhikode, thrissur, Malappuram etc. In Orissa Nayagarh, Cuttack, Ganjam, Keonjhar, Koraput and Kandhmal. The world famous Sun Temple in Orissa was also submerged by the flood. At last we can say floods are harmful for peoples and also for nature. Many casualties have happened in India like death of living beings, detriment of forest and crops by the flood. Physical structure of India also have damaged by flooding.